Personal bias alert: I like digital flangers, but most can’t do what true, analog-based, tape flanging could do. Back in the day, the sessions for my band’s second album were booked following Jimi Hendrix’s sessions for Electric Ladyland. His flanging setup remained after the session, so we took advantage of it and used it on our album… and the sound of true, tape-based flanging was burned into my brain. This tip is about obtaining that elusive sound. The tape flanging process used two tape recorders, one with a fixed delay and one with variable speed. As you sped up and slowed down one recorder, it could lag or lead the other recorder, and the time difference produced the flanging effect. If the audio path for one of them was out of phase, as one tape recorder pulled ahead of the other one (or fell behind after pulling ahead), the audio passed through the “through-zero” point where the audio canceled. This left a brief moment of silence when the flange hit its peak. To nail “that sound,” first you need two delays. One has to be able to go forward in time, but since that’s not possible without violating the laws of physics (which can lead to a hefty fine and up to five years in jail), a second delay provides a fixed delay so the other can get ahead of it. Second, don’t use LFO control—if you don’t control the flanging effect manually, it sounds bogus. In this implementation, a Splitter in normal mode feeds two Analog Delays. One of them goes through the Mixtool to flip the phase for the through-zero effect. 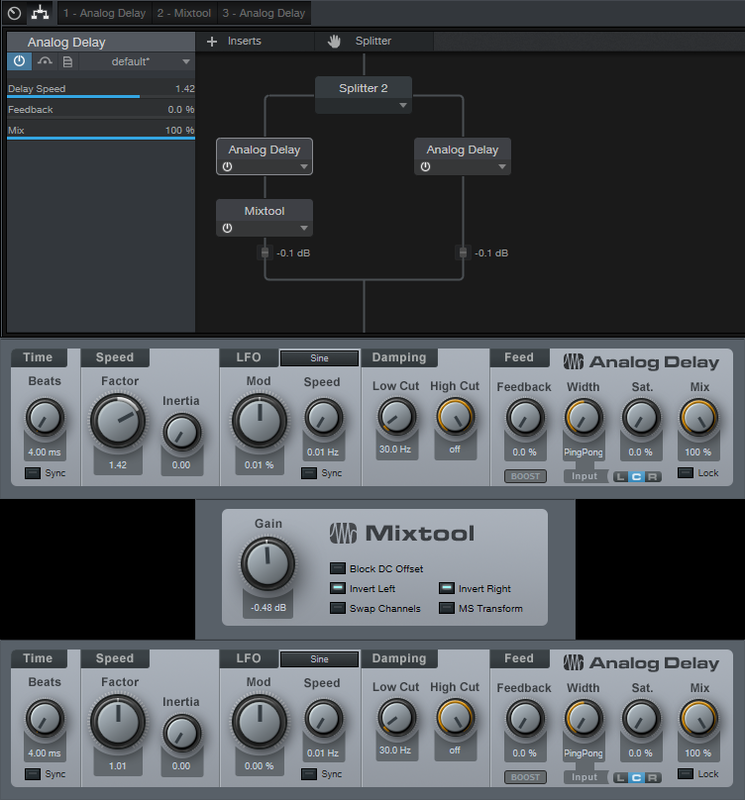 Start with the Analog Delay settings shown in the screen shot; they’re identical for both delays, except for the Factor control on the delay that feeds the Mixtool. It’s also fun to make an FX chain to allow for more variations. The left-most knob controls the Factor knob, whose parameter is called Delay Speed. 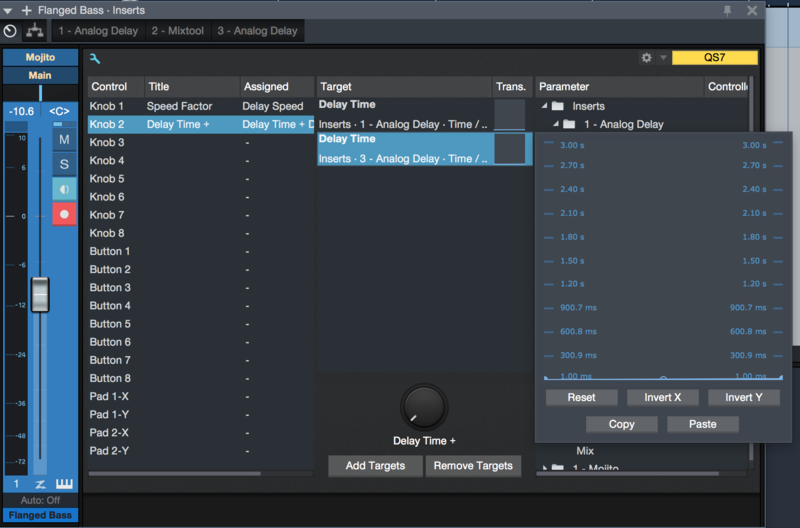 Delay Time chooses how low the flanger goes. It’s scaled to a range from 1 ms to 13 ms; I find 4 – 9 ms about right (copy this curve for the second Analog Delay, because you want their times to track). Delay Inertia uses the control on the same Analog Delay as the Factor knob being controlled. This adds a bit of “tape transport inertia vibe” when you move the Factor knob. The Mix knob controls the mix on one of the delays from 0% to 100%. (Note that if the Mix controls on both delays are at 0%, the audio should cancel; if it doesn’t, adjust the Mixtool Gain knob until it does.) 100% gives the most dramatic flanging effect, but back in the day, cancellations weren’t “digitally perfect” so setting Mix for one delay to 60-75% gives a smoother through-zero sound. Saturation controls the Saturation parameter on both delays when you want a little more grit, and a Low Cut control for both Analog Delays reduces some of the muddiness that can occur with long Delay Time settings. The Feedback control also ties to both Analog Delays. You’ll usually want to leave this in the stereo position (full clockwise). Finally, -/+ Flange controls the Invert Left and Invert Right buttons on the Mixtool module. Enable them for through-zero (“negative”) flanging, disable for positive flanging. So does it really sound like tape flanging? Listen for yourself. I took an excerpt from a song on my YouTube channel, applied flanging to it, and posted it as an audio example on craiganderton.com (click on the Demos tab). Bonus fun: Stick Binaural Pan after the two splits mix back together, and set Width to 200%. If Feedback is set to stereo, this produces a variation on the flanging effect. PreSonus asked for the preset at the last minute and unfortunately, I sent the preset for the analog delay. I’ve asked PreSonus to replace the preset at the end of the article with the new one. Sorry about that! This is also the multipreset to use for Windows if you don’t create your own. Not working so well on a Mac. The directory you reference exists under the Application contents, but putting it there does not get it found. I note, however, that all other presets in that entire directory tree have the names ending with .multipreset instead of .preset. Merely changing the name (and reindexing) did not bring up the preset either. How do I properly import this preset? Which directory should the file be placed in? When I loaded it up only the analog delay came up, not the whole chain. Thanks! It was indeed very tricky to hit 13 ms, you’re not imagining things! I nudged the right end of the line the least amount possible and as soon as it hit 13 ms, copied the curve to the other delay. Be patient…you have to move it just a little tiny bit. It seems the Analog Delay was designed more for longer tape echo effects, but it is possible to hit the specified range. Great tutorial and well written Craig 🙂 I hadn’t played with this kind of flanging before so it was fun. I instantly recognized the sound from a lot of pre-80s rock music. I noticed you recommended setting the Analog Delay Time curve’s limits on the “Delay Time +” knob to “1 ms to 13 ms”. Is there some easier way to set this in the Curve section of the Macro Controls editor? When I pull up Analog Delay’s “Time” as a Target and adjust the curve, the graph goes from 1 ms to 3.00 seconds and he range from 1ms to 50 ms is comprised of barely 2 pixels at the bottom of the graph. Am I missing something here? I took a picture of what I’m talking about below. Since you wrote the tutorial I thought you may have found an easier way to do it.